RV aircraft are designed to use Lycoming aircraft engines, with the exception of the RV-12 and RV-12iS Light Sport Aircraft models, which leverage the Rotax 912 series of engines. Van’s recommendation for the 4-place RV-10 includes any of the parallel valve 540’s which are available from 235hp on up to the 260hp version. The engine Van’s installed on our 4-place RV-10 is the Lycoming IO-540D4A5 rated at 260 hp. These engines are the most readily available, affordable and reliable of the possible choices. Other aircraft engines of similar configuration, weight and power can possibly be used, but only the Lycoming will fit the mounts and cowls supplied with our kits. Van’s volume allows us to buy appropriate models of new engines at OEM prices direct from Lycoming. 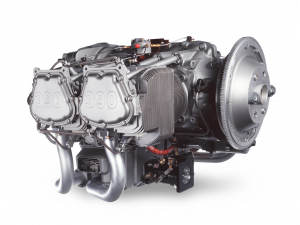 We make these engines available to our customers at considerably lower than list price. You can read more below about ordering an engine for your RV through Van’s. This arrangement makes them an affordable alternative, often even when compared to the traditional used engine. Van’s has similar OEM arrangements with Hartzell Propeller, Sensenich Propeller and other prop manufacturers. In fact, when you buy an engine and propeller from Van’s at the same time you may be able to benefit from an even greater discount than is represented by our already-lower individual item prices. That may sound a bit narrow-minded, but it reflects the basic truth: No non-aircraft engine has yet proven to be as reliable, maintainable, available and inexpensive (everything considered) as a traditional aircraft engine. It seems magazines are always printing stories about automobile engines bought for junkyard prices, mated to inexpensive reduction drives and flown off into the sunset. It simply doesn’t work like that in the real world. The reliability we’ve all come to expect from aircraft engines is the result of years of development and refinement of engines designed specifically for the task. Automobile engines function well in their intended application: delivering low cruising power in vehicles with well-designed transmissions and power trains. Using them successfully in an airplane requires continuous high power outputs and reduction systems coupled to the propeller. This is completely foreign to their design intent. You can imagine the car engine designer banging his head slowly against his desk…”No, no, no… If I’d known you wanted to do that with it, I would have designed something different…” In fact, we’ve had those very conversations with auto engine designers! With enough research and development effort, auto engines may be made to work acceptably or even well in an airplane. We are not opposed, in principle, to RV builders using alternate engines, but we would hope that this choice is made on facts, not hopes or dreams. Do you want to spend your time and effort on engine development or do you want to fly confidently behind an engine that has already been developed? We, too, would like to see “something better” in available aircraft powerplants. We are carefully watching a variety of developing alternatives. Meanwhile, the proven Lycomings do the job very well and are the best “available now” option. Despite the many claims and promises made by promoters, we feel that if you will look closely at what is actually available, how many are really flying, and how well they really perform, you will agree with our conclusions. While we are not opposed to RV builders installing alternate engines, we simply cannot recommend or encourage the installation of any other engine – we don’t feel doing so would best serve the interest or safety of the builder. An OEM agreement with Lycoming allows Van’s Aircraft to sell RV builders factory-new experimental engines at well below list price. This agreement specifies that engines may be sold only to those individuals who have purchased a complete RV kit. The engine must be installed in the aircraft specified on the order. Only one engine may be sold per RV kit, and Van’s must verify this information when the order is placed. The Lycoming engines we sell through Van’s are equipped with the lightweight starters, 149 tooth ring gears, dual magnetos, carburetors (or fuel injection systems) and engine driven fuel pumps. All of the engines listed below come with roller tappet lifters and camshafts as standard equipment. They have provisions (drive pads) for vacuum pumps and prop governors but these, along with alternators and exhaust systems, must be supplied and installed by the builder. The engines are built to the same standards as certified Lycomings, but do not come with the certified airworthiness paperwork. Some countries may require this paperwork, so check local regulations before ordering. Van’s can also supply certified engines if required; call or email us for prices and delivery. The X(I)O-320, X(I)O-360 (180 or 200hp) and XIO-540 engines are set up for constant-speed propellers as delivered (except for the XO-320 D2G which is a fixed-pitch only engine). The X(I)O-320 and X(I)O-360 (180hp) engines may be converted for fixed pitch operation with crankshaft plugs, which are available from our online store. All engines purchased from Van’s stock are packaged for long-term storage at extra cost. Engines with or without long term storage configuration may be drop-shipped directly from Lycoming to builders. All international sales must have long-term storage and are shipped from Van’s. The XIO-360-M1B (180hp) and the XIO-360-A1B6 (200hp) use the forward horizontal induction oil sump and injector body permitting the use of Van’s “horizontal induction” cowl that does NOT require an external scoop on the lower cowl, as seen on our RV-7A, 8A and RV-14A demonstrator aircraft. ALL other engines (except the XIO-390, which is also horizontal induction) have a vertical draft sump with fuel injection or carburetor that DOES require the external scoop on the lower cowl, as seen our RV-9A and IO-540 powered RV-10 demo planes. The XIO-390-A3B6 (210hp) can only be sold to RV-14/14A customers. Although this engine has been successfully used by builders on RV-7s and 8s, those models were designed and tested using the 200hp IO-360 engine, and as such that is the maximum power that we recommend and which we will sell for those aircraft. The XIO-540-D4A5 can be supplied with either a dual- or single-pulley groove ring gear. The dual pulley is used if an air conditioning compressor is installed. Lycoming Warranty: The builder has 2 years from the date of shipment to activate the warranty. The warranty is activated when the warranty card is mailed in. This should be done when the engine is first run. If Lycoming does not receive the warranty card within 2 years, Lycoming will automatically initiate activation. The warranty covers 100% for the first year after activation and is prorated for an additional year after that. Feel free to call us with any questions. The online order forms for Lycoming engines and the propellers sold by Van’s are available on the Order page.